The Investment Grade (IG) CDX has tightened in below 110bp today for the first time since last summer (for more information on credit indices see primer). Some of this move was driven by financials, as Goldman 5-yr CDS tightened 25bp to 270. IG CDX is now about 40bp tighter than the highs reached a couple of times last fall. The market now views the index locked in a range, and that is starting to be reflected in the swaptions market. Swaptions on IG CDX allow one to purchase a call option at say 125bp strike, protecting the holder from IG CDX widening above that level. This is quite similar to equity index puts, except it is often used to hedge credit portfolios rather than equities. 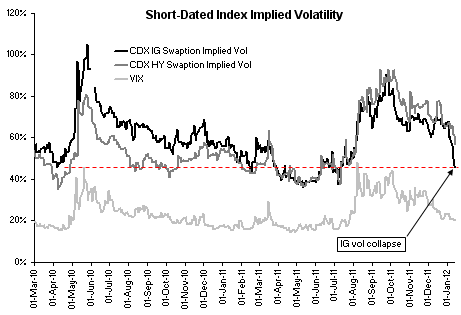 The short-term implied volatility of IG CDX swaptions is often traded against VIX on a relative value basis. While VIX crashed in during the last couple of months, IG CDX implied volatility did not follow for some time. 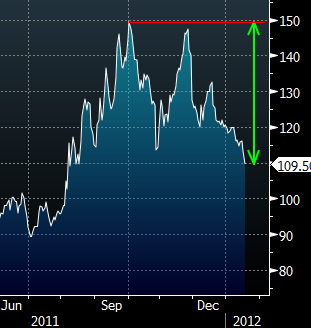 Recently however, after a sharp correction, the short-term IG CDX vol touched 50%, a level not seen since August. The IG CDX vol seemed to be expensive relative to VIX recently, and in the last few days the market took out this perceived mispricing. At 50% the implied volatility is now pricing in a roughly 100 - 150bp range for the index spread. Once the index vol drops materially below 50%, it could be a signal that the market is again underpricing risk, and IG CDX swaptions may become an attractive hedge.